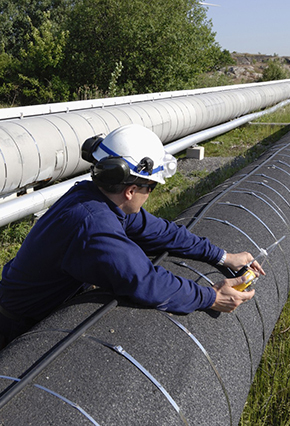 On May 7, the Department of Transportation’s (DOT) Office of Inspector General (OIG) released a report with the results of its audit of the Pipeline and Hazardous Materials Safety Administration’s (PHMSA) State Pipeline Safety Program. OIG initiated the audit in response to a safety recommendation issued by the National Transportation Safety Board (NTSB) following the San Bruno, California, pipeline accident in 2010. The Pipeline Safety Act permits the states to assume responsibility for regulating the safety of intrastate pipeline facilities, subject to certain conditions and PHMSA oversight. PHMSA provides participating states with federal grant funds to offset the cost of administering their pipeline safety programs. Under current law, federal funding can cover up to 80 percent of eligible program costs. OIG’s audit report concludes that PHMSA’s guidelines, policies, and procedures do not permit the agency to effectively manage its State Pipeline Safety Program and identify safety weaknesses in state programs. Weaknesses in the program include (1) an outdated formula for calculating state staffing needs for performing risk-based pipeline inspections; (2) lack of minimum qualifications for state inspectors; (3) lack of guidance on use of risk factors in scheduling and prioritizing inspections; (4) inadequate guidance and oversight of states inspection procedures; and (5) lack of written procedures for reviewing state grant expenditures. OIG also found that PHMSA’s assessments of state programs were inaccurate and that the agency provided insufficient guidance to states regarding use of financial hardship funds received during the recent recession. OIG’s audit report recommends that PHMSA implement several procedural and training measures to improve the agency’s oversight of state safety programs. House Committee Will Hold Hearing on the 2011 Amendments to the Pipeline Safety Act. On May 20, the House Transportation & Infrastructure Subcommittee on Railroads, Pipelines, and Hazardous Materials is scheduled to convene a hearing to review the Pipeline Safety, Regulatory Certainty, and Job Creation Act of 2011. Witnesses are expected to include representatives from PHMSA, the American Gas Association (AGA), the Interstate Natural Gas Association of America, the Association of Oil Pipelines, the DOT OIG, and the Pipeline Safety Trust. PHMSA Advisory Bulletin discusses lessons learned from 2010 crude oil pipeline failure. On May 6, PHMSA published an advisory bulletin (ADB) discussing the lessons learned from a 2010 crude oil pipeline failure in Marshall, Michigan. Among other things, the ADB encourages pipeline operators to take appropriate corrective actions to address potential integrity management program deficiencies, particularly with respect to the collection, analysis, and integration of threat-related data; to consider training their control room staff as a group to identify and respond to emergencies or other unexpected conditions; to evaluate the adequacy of their leak detection capabilities and implement any necessary improvements; and to review the effectiveness of their public awareness programs, especially with respect to whether local emergency response teams are adequately prepared to identify and respond to pipeline failures. PHMSA seeks comments on proposed revisions to gas distribution annual report form. On April 28, PHMSA issued a notice indicating that the agency is proposing revisions to the gas distribution annual report (PHMSA F 7100.1-1) and that it plans to submit the proposed form to the Office of Management and Budget (OMB) for approval. PHMSA is seeking public comment on the proposed changes, which include (1) requiring that operators specify the commodity type transported and file a separate report for each commodity group transported; (2) requiring that the operator’s form of ownership be specified; (3) including “reconditioned cast iron pipe” as an additional pipe material; and (4) revising the categories of leak causes to align them with those identified in the gas distribution incident report form; and (5) requiring additional information regarding the root causes of excavation damage. Comments on the proposed form and instructions are due June 27, 2014. PHMSA seeks comments on information collection efforts. On May 6, PHMSA issued a notice and request for comments regarding several information collection requests that expire in the spring and summer of 2014, including (1) safety-related condition reporting; (2) state gas and liquid pipeline Safety Program Certifications; (3) abandoned underwater pipeline reporting; and (4) periodic underwater inspections. PHMSA also intends to combine its information collections for abandoned underwater pipelines and periodic underwater inspections. PHMSA issued a notice of these information collection requests in January 2014 and received no comments. The current notice provides additional time to comment on the requests and announces that PHMSA will submit them to OMB for approval. Comments on the notice are due June 5, 2014. Status of PHMSA Rulemakings. The table below reflects the most current publicly available information on the status of PHMSA rulemakings as reported in the DOT’s April 2014 Significant Rulemaking Report. Additional information from the Office of Management and Budget’s (OMB) Office of Information and Regulatory Affairs (OIRA) is here. New information is reflected in bold. Note that on May 1, 2014, OIRA received PHMSA’s notices of proposed rulemakings regarding excess flow valves and the safety of onshore hazardous liquid pipelines. Under Executive Order (EO) 12866, OIRA reviews the proposals to ensure they are consistent with applicable law, the President’s priorities, and the principles set forth in the EO, and to ensure the proposals do not conflict with another agency’s policies or actions. Under the EO, OIRA is to provide PHMSA the results of the review within 90 days, unless that period is extended for an additional 30 days. The NTSB is conducting a safety study on integrity management. The NTSB is conducting a safety study to address gas transmission integrity management programs. The purpose of the study is to identify weaknesses in the implementation of continual assessment of gas transmission pipeline integrity in high consequence areas. FERC to address recent incident at LNG peak shaving facility. According to a recent environmental report, the Federal Energy Regulatory Commission (FERC) plans to require all jurisdictional operators to address the factors that led to a March 31, 2014 incident at a liquefied natural gas (LNG) peak shaving facility in Plymouth, Washington, once the investigation into the cause of that event is complete. The last significant LNG-related incident in the United States that FERC considered occurred in the late 1970s. AGA releases analysis of natural gas system methane emissions. On April 22, AGA released an analysis of the Environmental Protection Agency's (EPA) annual Inventory of U.S. Greenhouse Gas Emissions and Sinks. AGA's analysis focuses on the methane emissions from natural gas distribution systems and observes a 22% decline in emissions from this sector since 1990, even as the local distribution system has expanded by 600,000 miles of pipe in that same period. AGA credits the reduction to gas utilities’ focus on pipeline safety and the replacement of legacy infrastructure with modern plastic and steel materials. AGA also reviews the methane emissions from gas production, processing, transmission and storage. Shareholders file suit against PG&E following San Bruno incident. On April 22, plaintiffs representing the interests of shareholders in Pacific Gas & Electric Co. (PG&E) filed a derivative lawsuit against current or former corporate officers or directors of PG&E and PG&E Corp. The complaint alleges that the defendants breached their fiduciary duties, leading to the 2010 incident in San Bruno and causing substantial losses to the company. The plaintiffs seek, among other things, unspecified money damages, repayment of salaries that defendants received during the period of the alleged breach, and an order requiring corrective measures.